The Premier Payroll System is flexible, powerful and easy-to-use, with very rich functionality that can meet the needs of any organisation. 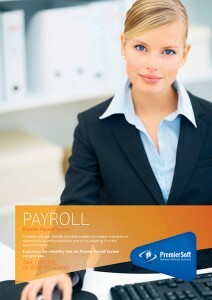 Premier Payroll has been specially designed for Cypriot legislation. It gives the ability to the modern enterprise of automating its payroll preparation process in an efficient and productive manner. It also aids project management by providing statistics on company costs and by handling personnel finance issues.